When you contact Brian and Sons Inc, you’ll enjoy peace of mind, knowing the right people are handling your comfort needs. We stand behind our work, performing conscientious service and guaranteeing your satisfaction, not just today, but for years to come. As part of the Comfort24-7 Network, we guarantee everything we do before, during, and after any sale or service and adhere to the highest levels of service and technical expertise. Our 100% Comfort Guarantee gives you the added protection you need to set your mind at ease. At Brian and Sons Inc, we live up to our promises and exceed expectations, or we make it right. Our job isn’t complete until you’re completely comfortable. By partnering with the Comfort24-7 Network, Brian and Sons Inc safeguards our customers with the “Comfort Promise.” You can trust our technicians to provide the highest quality service, respect your home and deliver sophisticated solutions to the most complex problems. As part of the “Comfort Promise,” our in-home sales and technical professionals are drug-screened, background checked and present identification when they arrive at your door. All Comfort24-7 Providers are fully licensed, insured, and Factory Authorized by Bryant to meet rigid training and customer service standards. To ensure the most in-depth product knowledge and HVAC-specific comprehension, every member of our team is NATE-certified, having passed industry-recognized and specialized tests. As a Bryant Factory Authorized Dealer, Brian and Sons Inc relies on Factory Authorized Parts, and our technicians continue to update their knowledge in the latest technology and most cutting-edge equipment. The Brian and Sons Inc “Comfort Promise” also includes a commitment to time management. We recognize your busy lifestyle, and while service schedules sometimes fluctuate due to the complexity of an individual job, you’ll never be stuck waiting for technicians or sales person to arrive. Once you provide a phone number where you can be reached, Brian and Sons Inc will call or text with updates on our arrival time. Keeping you informed every step of the way eliminates miscommunication and surprises. The team from Brian and Sons Inc will always explain the work, make cost-effective recommendations and present available options. No work will be completed without your full understanding and authorization. We respect your home as well as your time. Included in the standards set by our affiliation with the Comfort24-7 Network, we guarantee a neat and tidy jobsite. The Brian and Sons Inc technicians will wear booties and use floor protection to safeguard your carpets and flooring against dirt or damage. We clean up after ourselves, leaving your home exactly as we entered, with the added bonus of complete and rewarding comfort. As a Comfort24-7 Provider, environmentally responsible practices are a priority. The HVAC specialists from Brian and Sons Inc safely reclaim and recycle all evacuated refrigerant, as well as discarded equipment. In addition, all new Bryant cooling systems use Puron Refrigerant, which has been approved by the US Environmental Protection Agency. By partnering with Comfort24-7, Brian and Sons Inc is able to offer a Two-year 100% Money Back Satisfaction Guarantee on new system installations. If you’re not satisfied with your new system within two years of the installation date, Brian and Sons Inc will fix the problem at no cost, or remove the installed component and refund the installation cost. Our Lifetime Craftsman Guarantee covers all ductwork connections, transitions, flue piping and gas and electrical connections. Following a new system installation, we will repair any of these components at no charge to the original purchaser, as long as you still reside in the home. Brian and Sons Inc, as a Comfort24-7 Provider, guarantees 25% first-year energy savings. A new system that meets eligible efficiency levels will save you 25% in energy costs in the first twelve months or we will reimburse the difference between the calculated 25% savings and your actual savings. This means that if gas/electric energy costs, associated with operating your new heating and cooling system in the first year after installation, are not decreased by a minimum of 25%, when compared to the year prior, Brian and Sons Inc will pay the difference. 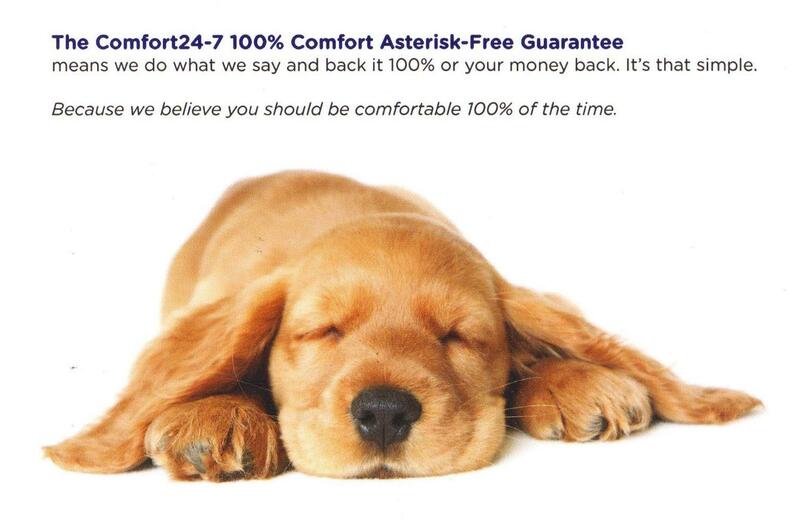 Included in the Comfort24-7 “Comfort Promise,” is our One-Year 100% Money-back Satisfaction Guarantee on service. We are entirely committed to your satisfaction, and completely confident in our workmanship. If you are not completely happy with the service performed by our technicians, Brian and Sons Inc will repair the problem at no charge or remove the installed components and refund the service cost. Contact Brian and Sons Inc today! Brian and Sons Inc is a Factory Authorized Dealer and a Comfort24-7 Provider. Through our affiliations with Bryant and the Comfort24-7 Network, we are able to provide our customers with top-notch equipment, expert service, and total peace of mind. When you contact Brian and Sons Inc, you’ll not only get the best value for your heating and cooling dollar, your investment will be thoroughly protected.